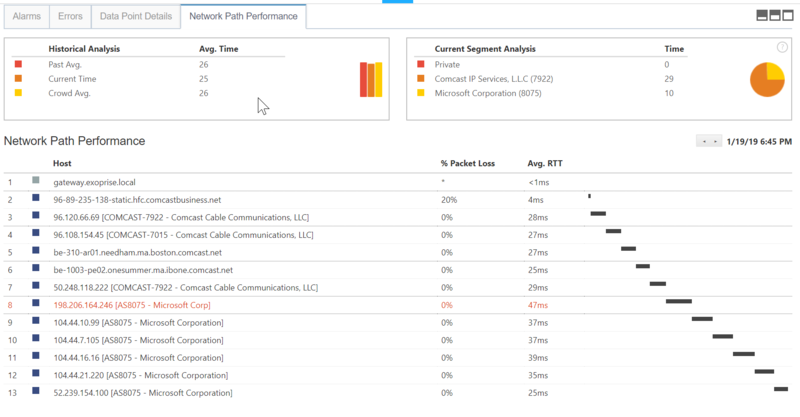 Network performance, low latency and good ISP connections are crucial to Office 365 end-user experience. These network characteristics are required for all of the Office 365 applications include Exchange, SharePoint, Microsoft Teams and Skype. While some applications may be more tolerant of higher latency, efficient routing and fast DNS lookups are vital to access your cloud services. Complaints about SharePoint or Exchange Performance are often linked to high network latency. Pinging a few Office 365 endpoints is a start but emulating and testing end-user access against the real applications will ensure your network is capable of delivering good user experiences. For real user sessions or synthetic sensors deployed to any location. Within 5 minutes of signing up for CloudReady you can compare your network environment to the crowd. Compare critical metrics for ALL of the Office 365 apps. Normally for web-based applications and services, a DNS lookup will recursively resolve to the root servers and then onto the DNS server that is responsible for the domain. But Office 365 and its services aren’t the typical services – they’re huge and spread throughout the world. Microsoft leverages your geolocation to ensure speedy access to Exchange and SharePoint online. 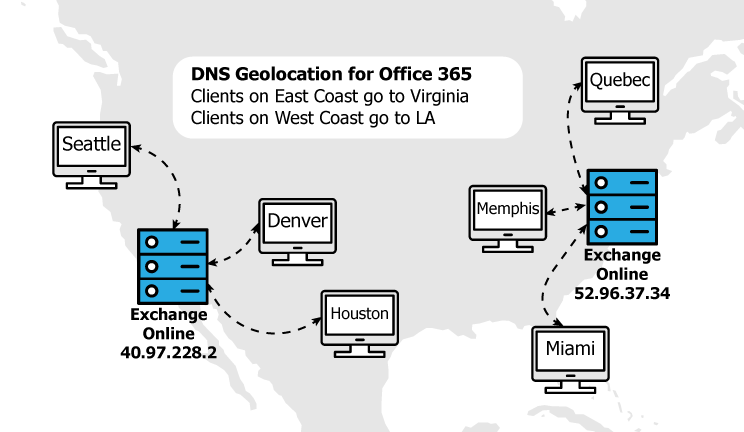 DNS lookups for Exchange Online and SharePoint Online will connect to the nearest Microsoft data centers and then operate via their fast backbone network. Generally, this works well but some enterprises may influence this geolocation lookup with their own routing overlay, proxies and/or mis-configured DNS caching and servers. That’s not something you want and you’ll want to test and compare your DNS performance for Office 365 services to others to see how your DNS resolution works. 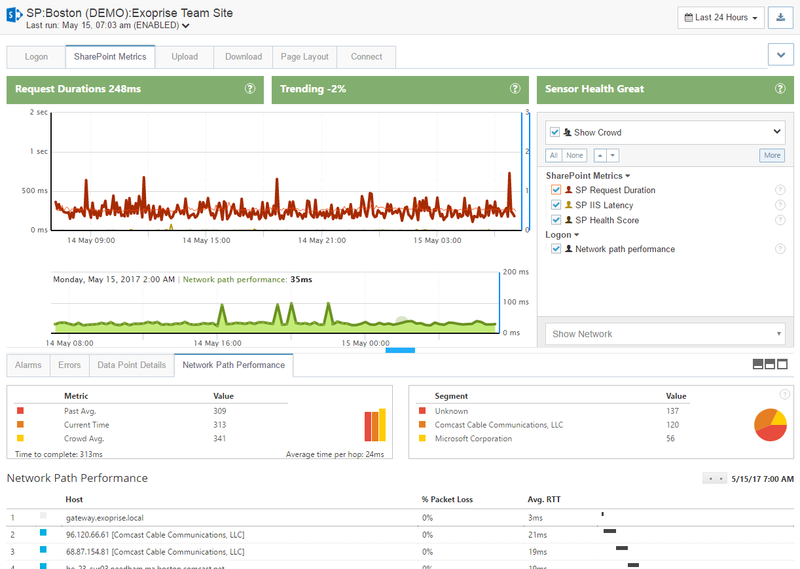 Easily deploy sensors for monitoring Exchange Online, SharePoint Online, Skype and Microsoft Teams to detect DNS resolution issues. Find and fix issues fast with a free trial. CloudReady proactively monitors all of your DNS lookups and enables you to compare your performance to crowd-sourced benchmarks. Measure, adjust, rinse and repeat. The Domain Name Service is critical to all of your Office 365 and cloud services. When DNS is slow and not cached well, all of your app access will suffer. See where your DNS performance is slowing you down. CloudReady supports passive capture and active baseline tests from the same product. Often customers for cloud services are migrating away from on-premises equivalents like SharePoint. And with that migration from inside to outside the firewall, customers will still want to proxy their web access. Customers must pay attention to their end-user experience through their proxy infrastructure. Proxies, their latency, routing and overhead must be measured to ensure acceptable performance and capacity. 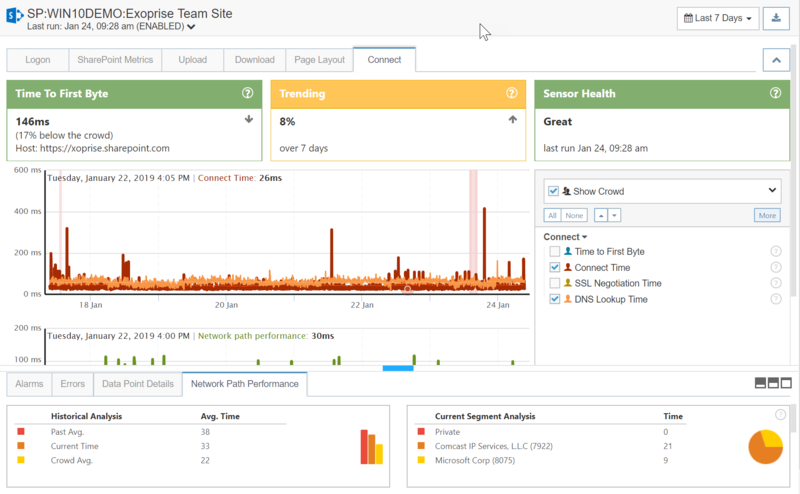 Measure and compare your proxy overhead for accessing cloud services. 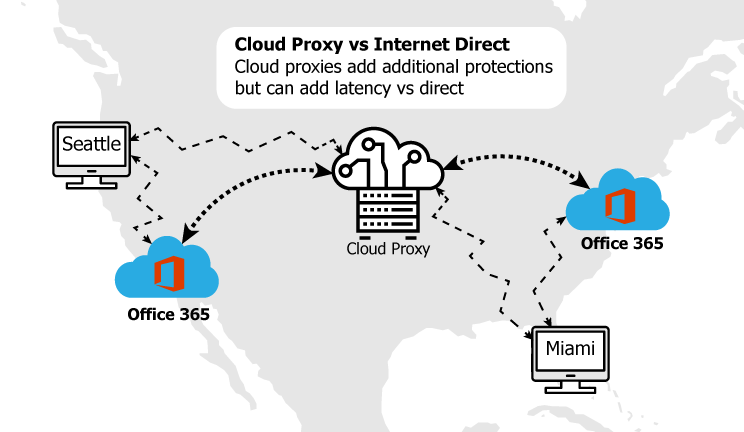 Even when proxies are transparent, CloudReady can show you connection and network latency. Exoprise CloudReady is the only performance management tool that fully supports cloud and on-premise proxies with NTLM and/or Kerberos authentication. Proactively monitor your end-to-end connections and compare historically or against crowd-sourced ISP connections. Deciding on routing behavior for cloud service access from HQ and Branch offices is a crucial migration decision but also requires continuous attention and monitoring. Network changes like MPLS routing, VPNs and Express Route should be tested before, during and after they are made. If you are routing cloud traffic from branch offices through HQ egress points, CloudReady reports on slow local LAN/WAN/SDWAN or MPLS performance. The first segment after the corporate gateway is tallied and crowd-sourced by ASN and ISP provider. Quickly determine if the ISP is slowing down. Internet Service Providers frequently reconfigure their backbone and Internet peering exchanges. 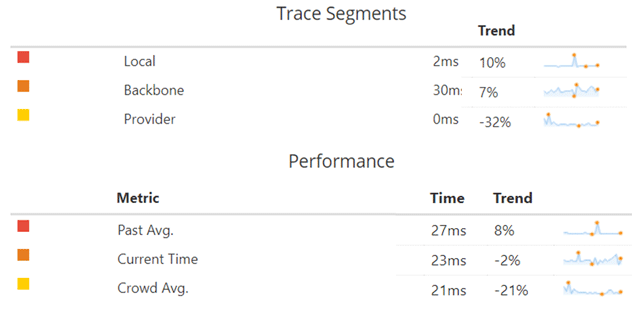 CloudReady can help you trend, baseline and compare your backbone performance. Instantly detect when the providers like Amazon, Google or Microsoft are slowing down, re-configuring their networks and cloud datacenters, or suffering from an outage of any kind. For more information on Office 365 network connectivity principles, see Office 365 Network Connectivity Principles.